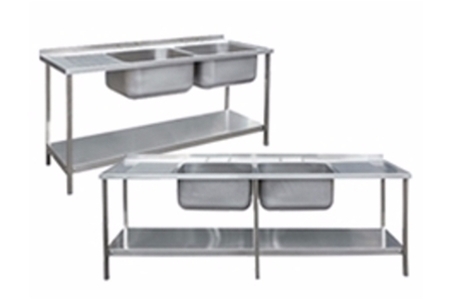 This comprehensive range of UK-made stainless steel sink unit assemblies offers a choice of options and sizes, from a 1000 x 600 single bowl, single drainer, through to a 2400 x 650 double bowl, double drainer. And, for ultimate flexibility, Die-Pat can offer variations on standard sizing to suit customers’ specific requirements, with the added option of sourcing triple bowl solutions. 304 Stainless steel sink top. Fitted with adjustable feet for on-site levelling. Supplied flat pack with full instructions for easy self-assembly. A well kept bowl sink will keep your catering business operating for years, if not decades. The 304 stainless steel that they are constructed of is lightweight, amazingly strong, and tends to repel much of the damage that would make other types of sinks useless after a few years.